Milk: A Great Source of Protein, Calcium, & . . . Trips to Italy? No use crying over spilt milk . 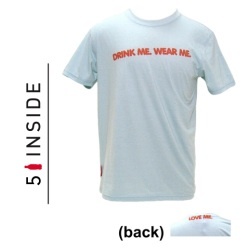 . . except when it can cut you a deal on flights to Italy! Expedia, the online travel provider, has come up with a unique and somewhat subtle way to advertise its flight deals to Italy from Germany. 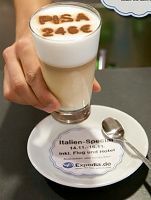 By teaming up with coffee shop Deli Star, Expedia is targeting German travelers by utilizing cappuccino’€”which is, after all, Italian at its core. 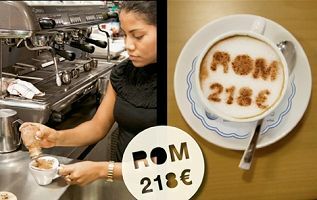 By holding stencils over the cappuccino milk foam and sprinkling chocolate powder, Deli Star workers created surprisingly legible’€”and effective’€”travel offers. Paper coasters placed under the cups gave further details on the travel deals and provided additional branding exposure for Expedia. Talk about ordering a coffee to go. . . Since 2007, Coca-Cola has made it a company goal to turn around the image (and carbon footprint) of its corporation. Once an eco-offender, producing tons of waste and run by gas-guzzling trucks, Coke is now one of the ‘€œgreenest’€ brands in the U.S.
Coca-Cola’s billboard has overlooked New York City’s Times Square for decades now, a continuous resident since 1932. This year, however, the brand rang in the new year by reinventing their memorable advertisement by using wind power to light the digital screen. According to Coke, this commendable move will reduce 376 metric tons of carbon dioxide emissions annually – the equivalent of converting 38 houses to clean energy for one year or planting 471.5 acres of trees. But even better yet: this transformation has started a trend among 30 neighboring billboards, preventing a combined total of 1,866 metric tons of carbon dioxide emissions annually! 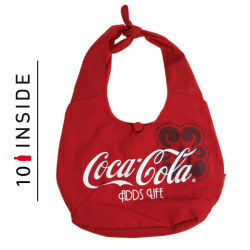 Coke has also hit the fashion scene in past years with its eco-friendly fashion line of clothing and accessories, all of which are made from recycled products. 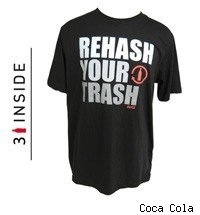 Trendy t-shirts, which display sayings like, ‘€œRock your rubbish’€ and ‘€œRehash your trash,’€ can be found at www.cokestore.com. Learn more about the company’s recycling programs and how you can help in your own community by visiting www.livepositively.com. Much like years past, New York City’s Times Square is bringing together some of the biggest brand names for the all-time New Year’s Eve celebration. And once again, out-of-home advertising is the star of the show. This year, however, sponsors are getting a bit more creative and optimistic (not to mention frisky) in an economy that has seen mostly pessimism and stagnation in the past year. From confetti wishes and kissing stages to wind-powered digital billboards, it will truly be a site to see. New this year at midnight, Times Square will rain hopes and dreams’€”literally. The Mars brand’s newest candy bar, 3 Musketeers Mint, is sponsoring a Wishing Wall for people to submit their resolutions, goals, and hopes for 2009. The messages will then be printed on tiny pieces of paper and dropped over Times Square at midnight, showering New York City with over a ton of wish-covered confetti. 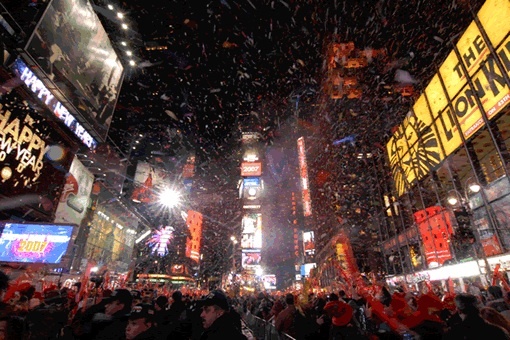 Wishes can be submitted online at http://www.timessquarenyc.org/nye/nye_interactive.html or in person at the Times Square Information Center. Echoing Mars’ upbeat tempo is Pepsi’s new ad campaign focused on youthful optimism that will blanket the billboards of NYC. 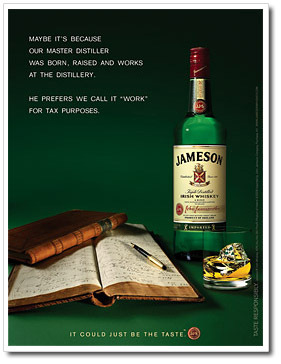 The campaign, titled Wordplay, creates uplifting words out of the brand’s redesigned logo. As part of the NYE festivities, the company will unleash one thousand balloons (complete with new Pepsi logo, of course) on Times Square minutes before midnight. Stuck at home for New Year’s? You can still be a part of the action by texting “Change”, along with your own message of optimism, to 66333 where it could appear on MTV’s Times Square screen or in their coverage of the celebration. Not to be outdone, JVC’s iconic (and newly designed) digital billboard will also allow partygoers to take pics from their cell phones and upload them to nyc@jvcnewyear.com. Once approved, they will display for three seconds on JVC’s 19- by 34-foot high-def screen. With luck, the hope and happiness theme will carry through the coming year, lifting our spirits (and possibly the economy) along the way. Happy 2009! Recently I had the opportunity to contribute to a recent Digital Signage Universe article titled, “If You’re Not on the Plan, You’re Not in the Buy.” The piece discusses the rapid growth of digital video advertising networks (VANs) and the obstacles these companies are facing as they try to build an advertising revenue stream for their emerging medium. I won’t regurgitate the complete article here…instead I encourage you to take a few minutes to read the original. However, I will say that the challenges I hear discussed specific to this channel are reminiscent of those raised in the early days of Internet marketing…how do we measure it, which budget does it fall under, can we achieve enough scale with one or two providers, etc., etc., etc. Of course, we all know how that one worked itself out — with online advertising, in all its various iterations, becoming a part of almost every advertiser’s arsenal. It will be interesting to see what the next 3-5 years hold in store for this fledgling, multi-sensory, place-based customer communication channel.